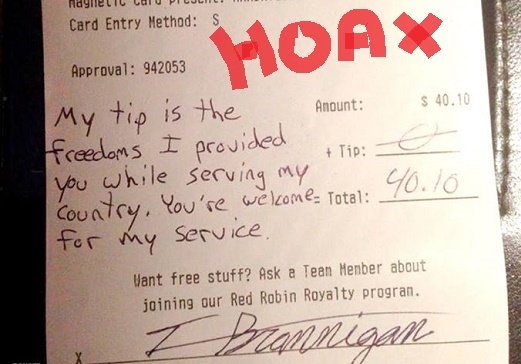 Home → Across America → Soldier Refuses to Tip Server is a HOAX ! This story is a hoax — IT NEVER HAPPENED. Is it possible that Dana Morales is at it again? Who knows, but what we do know is that everybody wants to be viral and everybody has a gimmick and most importantly — FACEBOOK and NEWSMAX are the final frontiers for every gullible moron on the face of the earth. The dumbest of the dumb see this and what do they do? They pass it on to someone else. When is this going to stop? The answer is that it will never stop because Americans are getting dumber and dumber. It’s too late…it’s too late. Neither the restaurant nor the server are mentioned because there is no restaurant and there is no server. This was a scam created by a few not-so-clever guys who work in the design department of a military catalog that sells clothing and camping supplies. In other words, the whole soldier refusing to tip thing is a hoax. It was never even supposed to be seen as the truth but don’t tell that to the community of Facebook Simpletons Who Share. They want more than anything for this to be true. This is their reason for living. Please drop them from your Facebook page and put them out of YOUR misery. Naturally, the morons of the world pass this along as a great scandal — please — anyone on your Facebook page who shared this with you needs to be dropped right NOW. A famed zoologist and TV writer disagrees with me…this time I think he’s way off. “Hey, Damien. Many people who create their social life on Facebook are looking for conflict or drama in that imaginary life. This doesn’t mean that they are morons or stupid like you say. Some of them are highly intelligent and inventive and imaginative. It’s just that their Facebook has gotten dull or humdrum. For the most part It simply means that they want to keep the story line of their Facebook more vibrant. By using shared information like this, even though it proves to be false, they move things along the way a daytime dram or soap opera opens up to new characters and new drama. It’s a human nature kind of thing.” [D. D. Mattia] <— read about this dude and judge for yourself. Sometimes he is smart and sometimes he’s a moron too. Franco's Home Run Stealing Ball Bully Identified!